In May of 2009 the Franchise Protection Act became law  this act greatly enhances the protections the franchise law affords Connecticuts dealers. 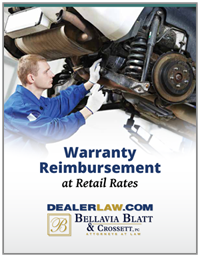 Our law ensures that dealers are properly and fairly compensated by the manufactures for warranty labor and parts work. This is not a one-off benefit – dealers are allowed apply more than once but no more than twice in any calendar year. Many dealers applied for retail reimbursement when the law was originally enacted but many others did not; and even for those who did we feel that the potential for a significant revenue increase is well worth taking an initialor another  look at. To that end we have asked Attorney Len Bellavia of Bellavia Gentile & Associates to come speak to our members on this subject. The law firm of Bellavia Gentile & Associates is widely regarded as a pioneer in the area of warranty reimbursement at retail and is a nationally known dealer advocacy law firm. Leonard A. Bellavia, Esq. is a recognized authority in this area and has represented hundreds of dealers in obtaining retail reimbursement. This workshop is designed for BOTH categories of dealers: those who have and have not obtained retail reimbursement under the Connecticut statute. Attorney Bellavia will explain common mistakes dealers make in applying for retail that cost them hundreds of thousands of dollars in lost revenue. This workshop will take you through the process step by step while allowing you ample time to ask questions and get all the answers you need to take advantage of our improved franchise laws. Who Should attend? Principal, General Manager, Service Manager or Parts Manager. Seating Is Limited For This Workshop So Register Today!